Angelitos Negros was premiered in 1972 by the Inner City Repertory Dance Company of Los Angeles as part of the dance suite, "Songs of the Disinherited." It is in the permanent repertoire of the Cleo Parker Robinson Dance Ensemble and the Lula Washington Dance Theatre. 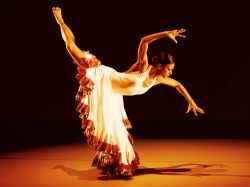 It has been performed by Elizabeth Roxas of the Alvin Ailey American Dance Theater, Roxane D’Orleans Juste of the Limón Dance Company, Melissa Young and Nycole Merritt of Dallas Black Dance Theatre, and is a signature performance piece for dance soloists Stephanie Powell and Nejla Yatkin. But never have you remembered to paint a black angel."